Accented with grommet detail, this vegan leather crossbody has top zip access and a maximum drop length of 23.5 inches. Its spacious interior is fully lined and features a center zipper compartment for separate storage. Beautiful Sydney Love silver colored hardware accents the bag inside and out. 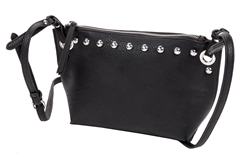 The adjustable strap makes wearing this bag versatile, either as a crossbody or over the shoulder.